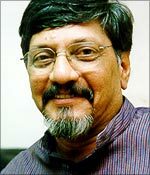 While the average Bollywood viewer may remember Amol Palekar as the everyman hero, discerning audiences know he is a filmmaker with rare insight and sensitivity. How do you describe your trilogy on sexuality? I made Daayra (The Square Circle) in 1996, Anaahat (Eternity) in 2001, and the bilingual Thaang (The Quest) is the latest. These three films deal with the man-woman relationship in the context of particular situations -- confusions about gender roles of a rural girl and transvestite dancer; the sexual awakening of a queen in the 10th century BC, or the sexual incompatibility between an urban married couple. Issues relating to gender are often discussed at a peripheral level. I like to explore the complexities and intricacies of gender play and sexual politics from various angles. Why did you choose to make the film in two languages? This is the first time a movie is being made simultaneously in Marathi and English. I make films in Marathi with a sense of commitment to regional cinema. Marathi cinema, despite a great tradition of V Shantaram, Raja Paranjape and Prabhat studios, has lost its stature and aura. It has always had to take on the onslaught of Hindi cinema, a 'two swords in the same scabbard' kind of situation. Making Thaang in Marathi was a conscious choice. Everyone who read the script by Sandhya Gokhale said the film should be made in English instead. The universality of the subject matter and mature handling and structuring of the screenplay evoked this response. We also felt that a very large chunk of the population -- especially the younger generation -- would understand the issues better in English. Also, at the international level, it becomes that much easier. Were you apprehensive about which brand of English to use, considering the characters are Indian and the audience, international? There is no universal standard of English. Each community -- let alone country -- has its own accent. As the accent changes from state to state in America, all Indians have their own identifying accent. Through all those differences, we do understand 'English' films. The audience response from Australia and America, where the film has been screened, is very reassuring. Was the process of shooting in two languages strenuous? It was certainly tougher for the actors than the technicians. We finished the shooting for both films in 25 days. However, we felt the strain at the postproduction stage, especially the sound work. After working with Bollywood biggies in your last film Paheli, was it a conscious choice to make this film without big names? Honestly, I decide on actors after considering the script. Excellence in performance is the only criteria. Besides, the big names have their own calculations of success that often prevent them from exploring non-mainstream themes. Nonetheless, you managed to rope in an actress of Vijaya Mehta's stature. She has not acted for almost 18 years now. What brought her to this role? I have a wonderful relationship with Vijayabai. Knowing that she hadn't been acting, I never asked her. However, Sandhya had written the character keeping her in mind. Upon Sandhya's insistence, I dared to ask Bai, who read the bound script and loved it. She agreed immediately! Her performance, her pauses and presence are tremendously powerful. Pramila, India's first beauty queen, passed away recently at the age of 92. She too acts in this film. How did you select her? What does she play? Sandhya has tried to portray different kinds of companionship, besides a man-woman relationship, that can be very fulfilling. The protagonist's mother and her mother-in-law share one such bond and are played by Vijayabai and Pramila respectively. I knew Pramila for the last 35 years. She was my friend Hyder Ali's mother, a woman truly beyond her time. Her zest for life used to inspire me. She used to like my work as an actor and also as a director. Although I am glad I could capture her last glimpses in Thaang, her demise is a great loss in my life. Mrinal Kulkarni plays the protagonist. Rishi Deshpande, Shishir Sharma and G P Deshpande have lent an edge to their respective characters. Sachin Khedekar, Sonali Kulkarni, Amruta Subhash and Rakesh Sarang too project exact shades. The audience will decide whether my choice has been right or wrong. Is it difficult to find a distributor for such non-mainstream films? It is certainly difficult to market such films. It is becoming very difficult to distribute regional cinema beyond major cities. At least multiplexes offer a good outlet, even then, the print and publicity costs are too overbearing for smaller productions. Besides, we cannot afford to bombard the national audience with paid promos that run for 24 hours at a phenomenal cost. Such films have to be nurtured and distributed in a different way. Anaahat was the first Marathi film released only in multiplexes across the country with English subtitles. My film Dhyaasparva was taken to remote corners of Maharashtra over a period of six months. The Web or satellite DVD theatres may offer viable options to reach inaccessible areas. How do you manage to continue along your own distinctive path, despite so many difficulties? Conviction and faith in my intentions are my driving forces. Besides, my friends, family, actors and technicians with whom I have been working for so many years, have supported my efforts. I am indebted to them all. I complete 50 years in this career next year, and the struggle is still on. But I have no regrets as I have chosen this difficult path for myself. Palekar Saheb, tumhi maharashtrachi shan aahat. Truly a great artiste and intelligent film maker! All the best to Amol Palekar.